A jovial ribbon-cutting ceremony at a small red brick church in Greensboro, the third-largest city in North Carolina, was something of a masquerade. It was really a bold stance for environmental justice. The solar panels gleaming on the roof of Faith Community Church are meant to generate power—and controversy—because they defy a state law prohibiting anyone besides major utility companies from selling electricity. It’s not an outright ban on consumer solar panels, but it’s close. And it’s backed by the energy giant Duke Energy. The church in partnership with a local environmental social justice group, the North Carolina Waste Awareness and Reduction Network, NC WARN, wants to change that. “This giant monopoly…should not be entitled to the energy from the sun, which God has given to all of us,” said Rev. Nelson Johnson, senior pastor at the Greensboro church. Johnson, a North Carolina native, is known across the state for decades of work on social and economic justice issues. 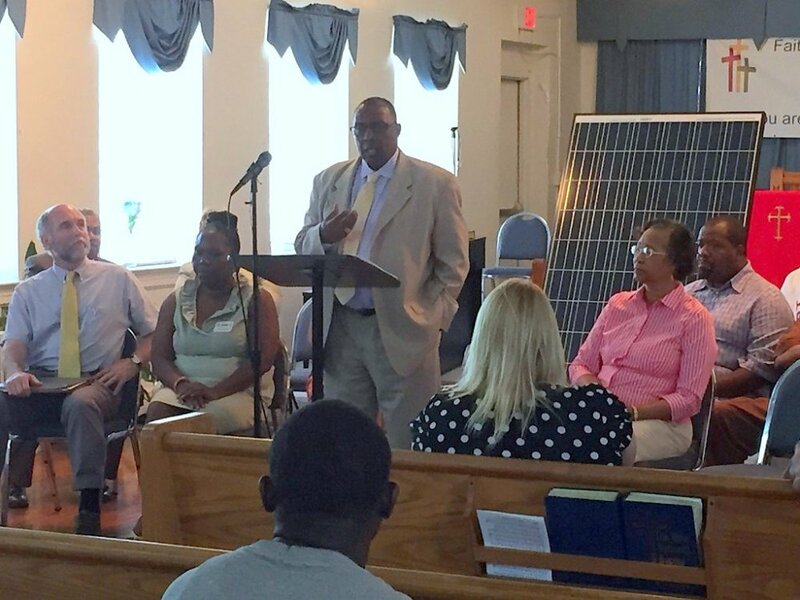 Faith Community, a non-denominational, largely African-American church, installed 20 rooftop solar panels on June 17. NC WARN owns the panels and is selling the electricity directly to the church for a low cost, in a challenge to North Carolina law. North Carolina is one of four states where third-party groups are restricted from selling electricity. Duke Energy, the state’s largest utility, has opposed this form of competition. But North Carolina law doesn’t explicitly ban third-party solar; it is just implied through the state’s definition of a utility. The church is creating a test case to force regulators to make a decision and clarify that definition. With the North Carolina Utilities Commission expected to review this case in the coming months, Duke has agreed to connect the panels into the grid until the commissioners make an official decision. The defiant collaboration between the church and the local group comes at a time of fierce debate among North Carolina lawmakers over whether to keep ramping up the state’s renewable efforts—or put on the brakes. It also comes on the heels of recent third-party solar victories in South Carolina, where Duke also operates, and Georgia. In both states, the success of third-party solar legislation stemmed from a striking collaboration between environmental activists and Tea Party members over a shared mission: the democratization of energy. This union led to the emergence of a group called “The Green Tea Coalition” in Georgia. “Some people have called this an unholy alliance…We agree on the need to develop clean energy, but not much else,” Debbie Dooley, the group’s founder, told Bloomberg News. Many utilities across the country, including Duke, view third-party solar as a threat to their traditional way of doing business. This is because the arrangement decreases a customer’s reliance on the grid and, consequently, erodes utility profits. In North Carolina, where Duke is headquartered, the utility’s disapproval carries significant weight. Half a dozen politicians and activists have told InsideClimate News that Duke was responsible for derailing a 2013 bill that would have allowed third-party solar. The same sources say the company is lobbying against a similar bill, called the Energy Freedom Act, proposed in March. The Republican bill with bipartisan sponsorship boasts support from 10 of the state’s largest companies, including Walmart, Target and Lowes. Still, it’s unclear if there’s enough support to pass the measure, which is stuck in committee. Duke spokesman Randy Wheeless declined to comment directly on the allegations. He told InsideClimate News, “I don’t think Duke is very supportive of a third-party sales bill.” However, following in South Carolina’s footsteps, packaging it with other clean energy issues that mean more to the company could change things, he said. He added that the company is against the church-NC WARN partnership and is following the case closely. NC WARN is basically looking to behave as a utility under its own rules, he said, and “that doesn’t seem quite fair,” he added. Solar energy is booming globally. That’s in part from small-scale, or distributed, solar, which enables citizens, businesses and nonprofits to provide their own clean energy. Take Germany, for example. The country’s ascent to becoming the world’s solar leader is largely driven by a policy that has encouraged distributed energy projects since 2000 by giving small producers incentives to compete with utilities. Today,nearly half of the country’s renewable energy comes from individual- and community-owned projects such as rooftop solar panels and backyard wind turbines. The United States ranks fifth globally for total installed solar capacity. One way solar experts say the nation can bump up in ranking is by further supporting distributed generation. California epitomizes this point. The state installed about 4,300 megawatts of solar in 2014, the most in the nation, through growing both large- and small-scale solar projects. That’s enough solar to power more than 1 million homes. Meanwhile, North Carolina came in a distant second with 397 megawatts of installed solar energy last year. That growth came almost entirely from large-scale projects. Only 5 percent of the state’s current solar capacity stems from rooftop solar. If third-party solar leasing is allowed, that percentage will likely rise. When North Carolinians pursue solar today, they have to pay thousands in upfront costs to solar companies for rooftop panels and installation. After the panels are connected to the grid, their monthly electric bills drop to zero. Still, even with certain federal and state policies, such as tax credits, in place, it can take years, possibly decades, to make up the initial investment. Called “no-money-down solar,” the third-party solar model targets people and businesses who can’t afford, or don’t want to pay, the thousands of dollars in upfront costs associated with buying and installing solar panels. Instead, a leasing arrangement is set up and the customers can start seeing savings right away. With third-party leasing, the companies involved, such as SolarCity or Sunrun—or in this case, NC WARN—replace your utility. They provide solar panels and install them at little-to-no cost. Then they charge you a negotiated rate for the generated electricity that you consume. The monthly bill is guaranteed to be less than your original electricity bill. That’s even if the third-party providers are charged by local utilities for hooking up their solar equipment to the grid and those costs could be passed on to the customers. Customers leasing panels, however, won’t save as much money in the long term as those who own their panels outright. That’s because the contracts with third-party groups often have customers sign away their right to collect on tax breaks or other benefits that might come with being a solar panel owner. 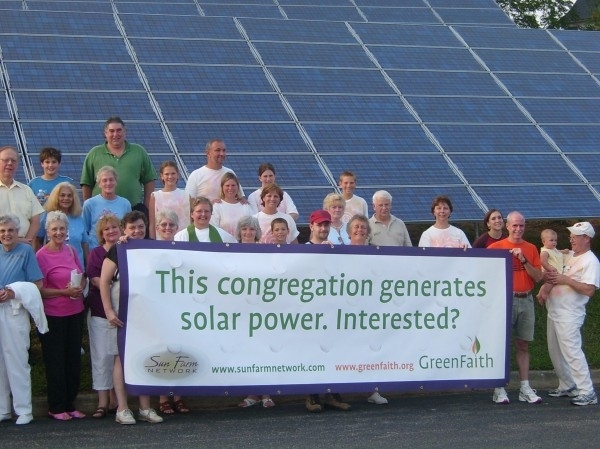 In the radical test case in Greensboro, the arrangement between the church and NC WARN differs slightly from the way the nation’s leading third-party solar providers operate. The nonprofit paid about $20,000 for the 20 solar panels––each about the size of a door––and their installation on the church. The money came largely from donations. The church has agreed to pay NC WARN 5 cents per kilowatt-hour for the electricity used­­––that’s less than half of the rate of its usual electricity bill. According to NC WARN executive director Jim Warren, the negotiated rates aren’t intended to make money for NC WARN; instead, they are meant only to cover any panel maintenance cost. Any additional money that’s generated will be funneled into purchasing solar panels to donate to other nonprofits or homeowners. 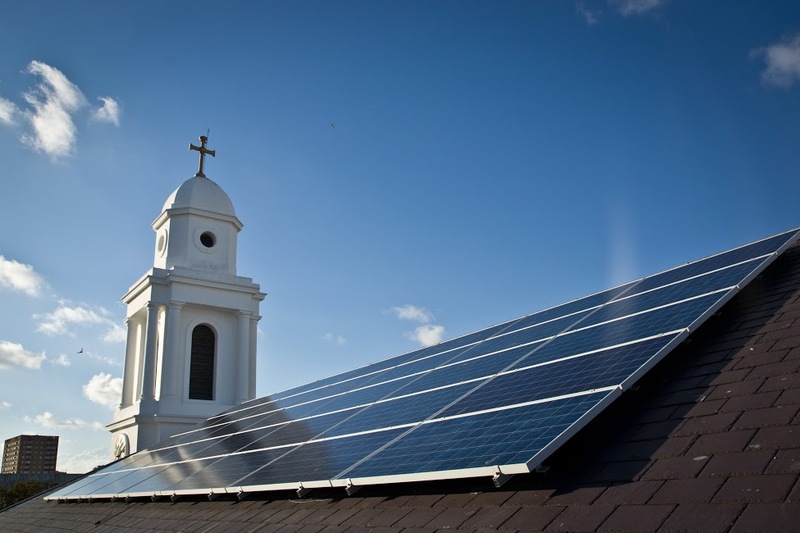 There’s 5.2 kilowatts of solar capacity on the church––not enough to completely power it. 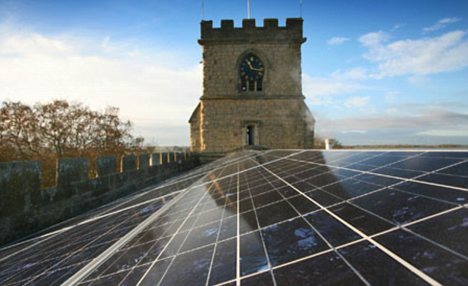 The church will pay Duke for any excess non-solar-related electricity it uses. Neither NC WARN nor the church is paying Duke for grid access. Knowing they were challenging the law, the church and the environmental justice group filed a 21-page request for project approval to regulators at the North Carolina Utilities Commission. In this filing, the groups suggest their unique partnership exposes a potential loophole in the state’s definition of utilities and utility jurisdiction. The commission has not yet processed the request. When it does in the coming weeks or months, there will be an opportunity for other stakeholders, such as Duke, to weigh in before an official ruling. Duke spokesman Wheeless told InsideClimate News the company plans to share its perspective on why this arrangement is illegal with the commission. Still, NC WARN’s Warren is optimistic. “We think we are going to win,” he said. But even if commissioners rule against them in the test case, he told InsideClimate that his group will “make sure the church has solar anyway.” The contract between the two groups stipulates that if this regulatory challenge fails, NC WARN will donate the panels to the church. This entry was posted in Corporate Dishonesty, Creativity & Environmental Issues, For The Greater Good Decisions, Fossil Fuel Production, Pragmatic Politics Versus Moral Principle, social justice, Water Scarcity, Windfarm Construction and tagged Climate Change, Climate Change Denial, Cutting Carbon Emissions, Global Emissions, Global Exploitation, Global Warming, Sustainable Energy For All by churchmice253. Bookmark the permalink.